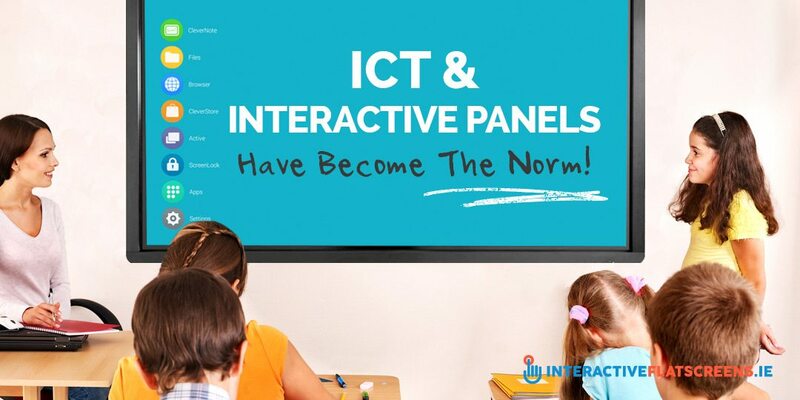 ICT & Interactive Panels Have Become The Norm! It’s an exciting time to be a teacher, and even more so a pupil. The information age is well and truly here and ICT such as the interactive panel has become the norm for schools everywhere. Gone are the days when children knew more about the devices they were using than the teacher. The old anxiety and fears about using ICT in the classroom are becoming a thing of the past. It is now generally accepted that ICT enhances the learning process in many ways. Primary level education is probably benefiting the most from ICT and this is appropriate as it is the most important level of education. The child’s learning experiences in these formative years will determine how they perform at secondary and higher level education. 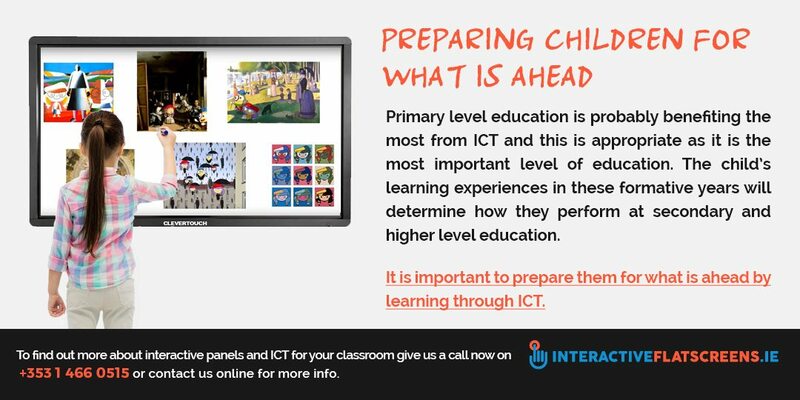 It is important to prepare them for what is ahead by learning through ICT. The interactive panel gives children more opportunities to interact, engage with and guide the learning a bit more. Because of this, they are more enthusiastic about learning. They will put their hands up and volunteer for the chance of engaging with the interactive panel. For they are allowed to explore with it – it is not just a matter of them sitting there while the teacher talks. Learning should be like an expedition – you must take part and find the learning. This is not full blown andragogy. It is merely using elements of that approach such as engagement and learning as ‘play’. It is about giving the child that much more responsibility for what they are learning so they can begin to acquire knowledge skills that will prepare them for the world they will enter when they are older. 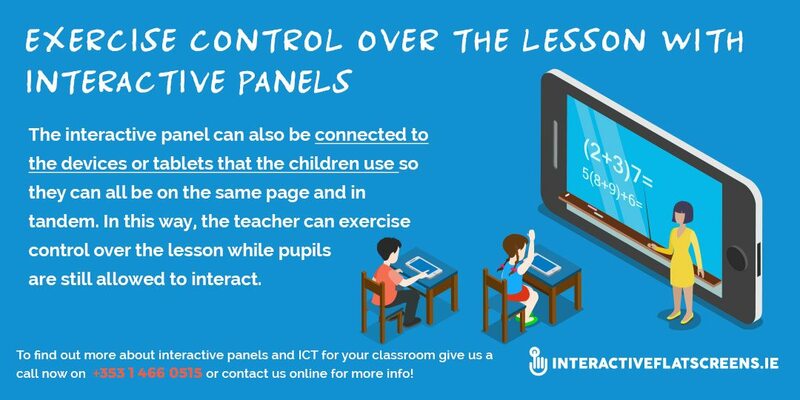 The interactive panel can also be connected to the devices or tablets that the children use so they can all be on the same page and in tandem. In this way, the teacher can exercise control over the lesson while pupils are still allowed to interact. Clevertouch produces touch screens especially for education. Their robustness and the software available makes them the ideal choice for educators. Linx is a good example of the kind of software that can be successfully used on the interactive panel. It is like using Powerpoint only it is more fun to use for both teacher and class. For those teachers who prefer a more traditional pedagogical approach to education, it should be stressed that the interactive flat screen serves this purpose as well. By hooking up to the device of each individual pupil to the interactive panel, they stay focused on the object of the lesson. This connectivity is something that is still being developed. Teachers have yet to get the maximum effectiveness out of it but it’s clear that it will support both the traditional approach to learning and the pupil centred approach. ICT will facilitate a synthesis of these two models as education progresses. To find out more about interactive panels and ICT for your classroom give us a call now on +353 1 466 0515 or contact us online for more info!